I have calculated the updated 2011 year-to-date (January 1 - June 30th) recent home sales data and market sales trends for the Traverse City area / Grand Traverse County and have posted the information above. 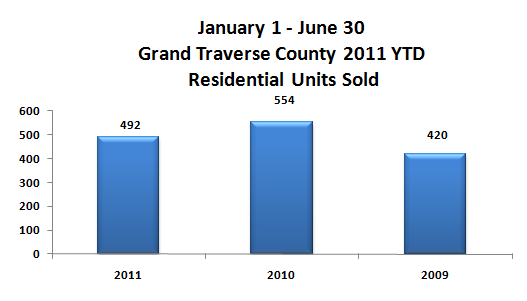 The home sales statistics compare housing sold in Grand Traverse County (Traverse City area) from January 1, 2011 through June 30, 2011 to the same time period in 2010 and 2009. This includes the townships of Acme, Blair, East Bay, Fife Lake, Garfield, Grant, Green Lake, Long Lake, Mayfield, Paradise, Peninsula, Union, Whitewater, and the City of Traverse City. As you will notice in the housing sales data posted above, 2011 residential real estate sold in Grand Traverse County has continued to remain identical to 2010 in terms of average selling price and median sale price, similar to the results from the first quarter of 2011 (January – March). Leelanau County home sales on the other hand have seem to have really taken off during the first half of 2011 (Please see separate post above). This report is based upon sales information obtained from the Traverse Area Multiple Listing Service from 2009-2011. Undisclosed sales are not included in the data. This is for basic review purposes only. All attempts for accuracy have been made but cannot be guaranteed.